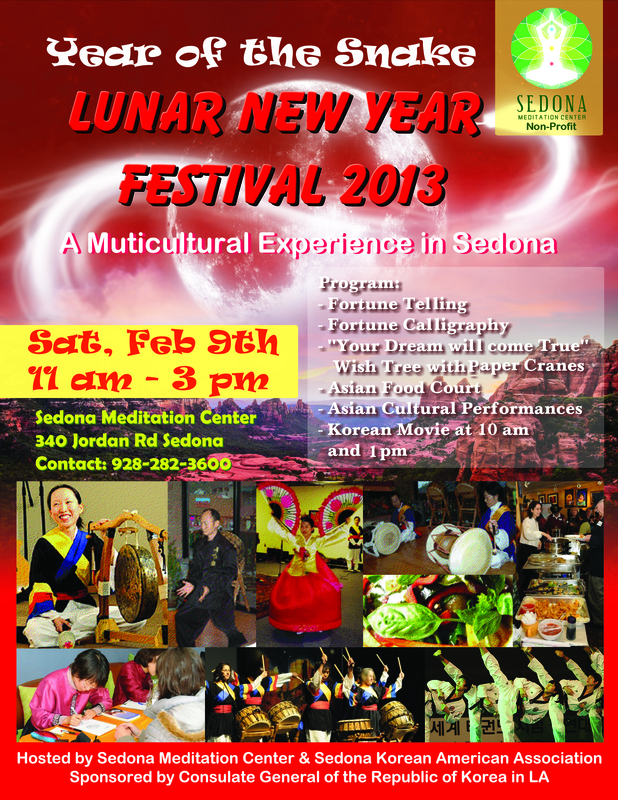 On February 9th the Sedona Korean-American Association will host the third annual Lunar New Year Festival. This unique opportunity for cultural exchange will offer traditional Asian food, games, film, fortune telling and New Year blessings for all visitors and residents of Sedona. This ancient celebration is observed the first two weeks of the Lunar year, and is enjoyed by billions of people in Asia and Asian communities in North America. This year is the Year of the Snake, which is known as being a time of wealth and wisdom. The holiday kicks off on February 10, 2013 and concludes February 24, 2013. The Lunar New Year festival is a time for families to reunite, elaborate meals, and special ceremonies to honor the family ancestors. The Sedona Korean-American Association (SKAA) is excited to bring a taste of this celebrated Asian holiday to Sedona for its third consecutive year. The festival will present a variety of cultural experiences for curious Sedona residents and visitors: traditional Asian food, folk games, authentic performances, personal Calligraphy, Lunar Zodiac readings, screening of a Korean film, and a wishing tree available for all guests. Paper cranes containing visitors’ wishes, hopes and plans will be placed on a Wishing Tree and displayed for 15 days, ending in a Full Moon Ceremony, February 25th. This is a free and public event hosted at the Sedona Meditation Center, located at 340 Jordan Road from 11am to 3pm on February 9th. Banya Lim, president of SKAA, will serve as the master of ceremonies and host of the Korean New Year’s tradition and games. She will also present a message of gratitude to all of the supporters of the “Korean War Veterans’ Monument”, to be unveiled March of this year in the Sedona Veteran Military Park. As the snake is a symbol of wealth and wisdom in many Asian cultures, the year of the snake is meant for steady progress and attention to detail. This bodes well for the Sedona and the Sedona Korean American Association, introducing this tradition during a peaceful year. The Sedona Korean American Association is a non-partisan, community-based, non-profit organization. It is dedicated to serving the Sedona community, particularly the needs of its Korean-American residents. It endeavors to promote inter-cultural understanding, educational activities, and communication with other ethnic groups in the United States.